It begins with a birth in an African village in 1750, and ends two centuries later at a funeral in Arkansas. And in that time span, an unforgettable cast of men, women, and children come to life, many of them based on the people from Alex Haley’s own family tree. When Alex was a boy growing up in Tennessee, his grandmother used to tell him stories about their family, stories that went way back to a man she called “the African” who was taken aboard a slave ship bound for Colonial America. As an adult, Alex spent twelve years searching for documentation that might authenticate what his grandmother had told him. In an astonishing feat of genealogical detective work, he discovered the name of “the African”—Kunta Kinte—as well as the exact location of the village in West Africa from where he was abducted in 1767. 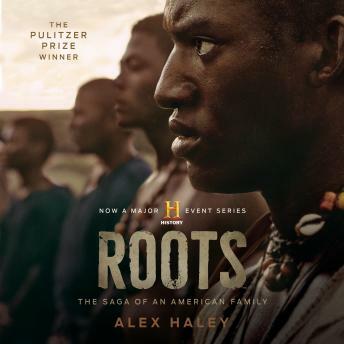 Roots is based on the facts of his ancestry, and the six generations of people—slaves and freemen, farmers and lawyers, an architect, a teacher—and one acclaimed author—who descended from Kunta Kinte. The story is incredible and Avery Brooks (narrator) is FANTASTIC! Well done. I love history and learning about slavery who doesn't????? It's amazing how people endure and overcome the tragic events of that time in history. Winderfuly written. Narrator was exceptional. It's been a while since I last read this book. It was great listening this time. Awesome book! Avery Brooks does an awesome job making this story come to life. I have never seen the film version of this book, but it so intrigued me. Entertaining for about 85% of the time, with a bit of a lull in the later chapters. I so desperately wanted to know what the outcome of Kunta and Belle, once Kizzy (well, no spoiler.) Most characters were likeable if they were and supposed to be, and despised when intended. That this was largely fact based with fictional aspects developed around research also added to the intensity of the book. Narration was good. Some character voices were too close to discern but context always made clear who was speaking. As a white 4th generation American, I got goose bumps the whole last part of the book, almost tearful. Highly recommend! !